Pyramids are a global phenomenon. For thousands of years, ancient cultures around the globe decided to erect Pyramids as if all of them followed an intricate blueprint from the past. Not a single expert today can answer why the ancients built Pyramids, and why so many of them are eerily similar despite the fact that mainstream scholars argue—the most distant civilizations around the globe were not connected. China is known for a lot of things, but a few know that many experts consider this part of the world to be home to the largest pyramid on the surface of the planet. During the end of World War II, American pilot James Gaussman prepared to complete a mission of providing food and supplies to the Chinese military forces. Suddenly, a fault in the aircraft engine forced his return to the Assan airbase in northern India, for safety, he performed his return journey at low altitude which made it possible to observe the incredible land below him. Shortly after flying over the city of Xi’an, heading southwest, the pilot encountered the presence of a giant pyramidal shape on the surface. Surprised, after making several passes over the structure, Gussman prepared to and took several photographs of the pyramid; he also created a detailed report, which he later handed to his superiors upon returning to base. But that’s just one reference to ONE of the many mystifying pyramids in China. The truth is there are many more Pyramids scattered across the region. If we travel Lake Fuxian, located in the Yunnan Province, China we will discover the remains of MASSIVE structures at the bottom of the lake. At the bottom of this poorly explored Lake—which stretches through Chengjiang County, Jiangchuan County and Huaning County in Yunnan Province, rising 1,720 meters above sea level and encompassing an area of 212 square kilometers—are structures that have mystified experts ever since their discovery. The enigmatic monuments were discovered in 1992 when expert diver Geng Wei came across hand carved flagstones and countless other stone relics scattered across the bottom of the second deepest freshwater lake in China. Geng Wei was left mystified by what many believe are the remains of a lost ancient city. So when were these enigmatic structures built? The answer is sort of simple: before the last Ice Age—when water levels around the planet were much lower than today. Is it possible that the ancient structure located beneath Lake Fuxian are the remnants of an ancient culture that flourished before Earth’s last Ice Age? And is it possible—as author and researcher Graham Hancock argues—it was around 13,000 years ago when a cataclysmic event wiped out advanced civilizations from the surface of the planet? After over thirty dives and aid from submarines, experts discovered the remains of massive stone slabs, stairs, and walled structures. However, that was not enough to understand what exactly was located at the bottom of the lake. Then, in 2001, archaeologists from the Hunan Provincial Museum used advanced sonar equipment and cameras to survey the bottom of the lake for the first time ever. The results convinced experts in the field that the remains at the bottom of the lake once belonged to an extremely complex and advanced ancient culture that inhabited the region in the distant past, capable of building massive structure and more importantly, PYRAMIDS. 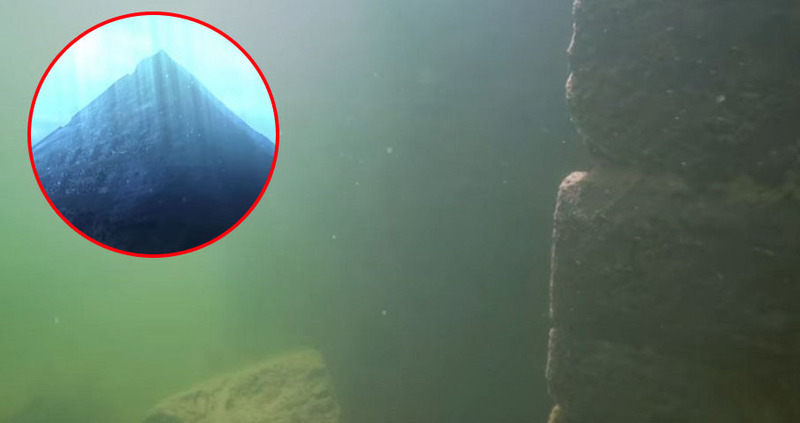 One of the submerged pyramids at the bottom of Lake Fuxian has a circular shape and has a base of around 37 meters, while the other two, of greater height, are connected to each other by a corridor of stone of 300 meters of length. What if the structure at the bottom of the lake are evidence that before the Great Flood—before the last Ice Age—an extremely advanced ancient culture inhabited the area? If so, who were they and what happened to them after the great flood? Looking back at historical records we will find evidence that an ancient city called Yuyuan was established in the region were Lake Fuxian is located today. Historical records show that the city ceased to exist after the Sui and Tang Dynasty (589-907AD). Curiously, according to local legends and folklore, the ancient city of Yuyuan and its people sank to the bottom of the lake. So, did experts find the remains of the ancient city of Yuyuan? The answer is no. Why? Because after several studies, experts concluded that the sunken city Yuyuan or the capital of the ancient Dian Kingdom was in fact constructed mostly out of wooden and clay materials. The remains at the bottom of the lake are mostly made of stone. As noted by the Epoch times, the pyramids at the bottom of the lake are far more advanced than other similar pyramids around the globe— as the stones are ornamented with various designs and symbols. Experts are said to have found curious shapes engraved on the stone structures at the bottom of the lake. Amongst the many engraved stones, one of them has attracted particular attention. On the top right of the slab, experts found a small carved circle with seven radial lines, a symbol that according to many experts is meant to depict the Sun. On the left side of the stone, there are more symbols; another circle with four radial lines.